We design and manufacture various kinds of fume scrubbing systems and dust extraction systems. Our systems are designed for different capacities. These come in single inlet and single width (SISW) configuration blowers. Impellers are dynamically balanced to offer high efficiency & lower noise level. 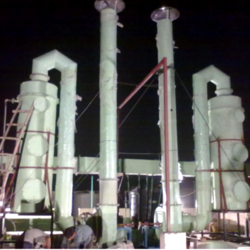 We offer a Fume scrubbing System that are made using PP/FRP, FRP, PVC/FRP, FRB, FRVE and M.S / FRP. These come in single inlet and single width (SISW) configuration blowers. Impellers are dynamically balanced to offer high efficiency & lower noise level.